If it can be said that any species of Inocybe is popular among those who collect mushrooms for fun or study (but not for eating! 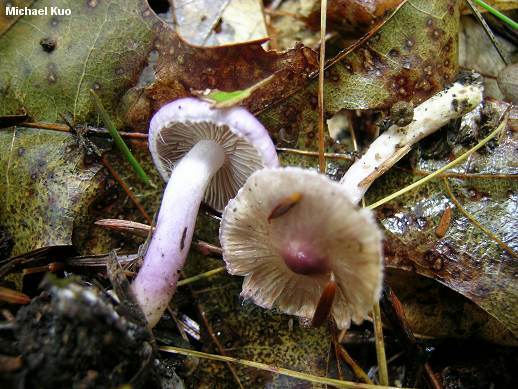 ), it would have to be Inocybe geophylla var. lilacina. In a genus filled with confoundingly similar species, this commonly encountered mushroom actually manages to stand out, which makes it a pleasure to find--plus, it's pretty. 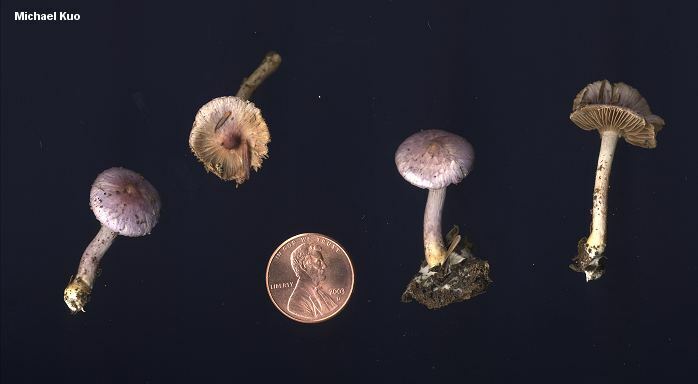 Still, I wouldn't bet my life savings (not that I have any life savings to bet, but if I did) on any Inocybe identification made without a microscope, and there are several similar, purplish species in the genus. Inocybe geophylla var. lilacina is, as its name suggests, lilac colored. 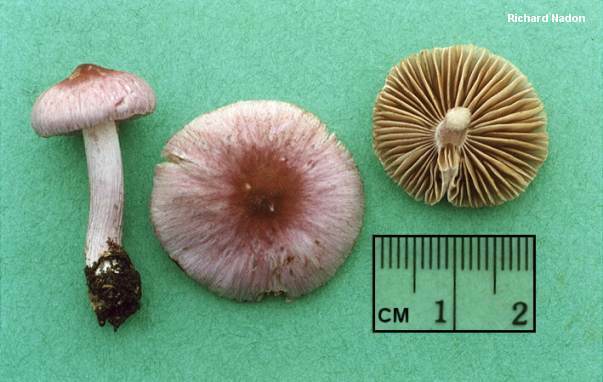 Other crucial identification features include its bell-shaped cap, spermatic odor, brown (but not rusty brown) spore print, and the cob-webby white cortina evident on young specimens. 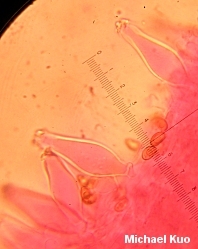 Microscopic features include its elliptical and smooth spores, and the distinctive thick-walled cystidia. Inocybe lilacina is a synonym. Inocybe geophylla var. geophylla lacks violet shades. 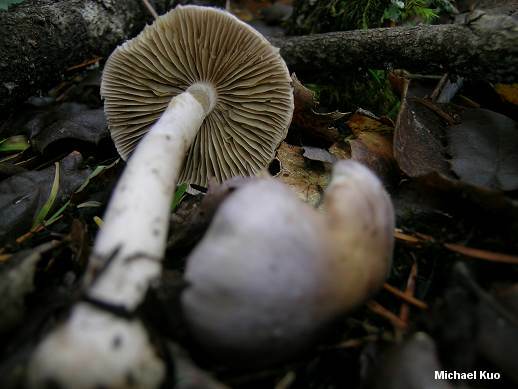 A number of varieties and forms of Inocybe geophylla have been documented. Ecology: Mycorrhizal with hardwoods and conifers; growing alone, scattered, or gregariously, frequently in the presence of Inocybe geophylla var. geophylla, according to some authors; late summer and fall (and winter in California); widely distributed in North America. 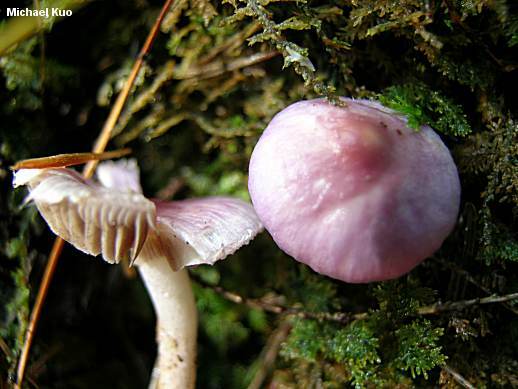 Cap: 1.5-4 cm; conical to bell-shaped, becoming broadly bell-shaped; dry; silky or almost smooth; lilac overall, but often with mottled hues of pinkish, whitish, or brownish; sometimes fading to nearly white overall when old or exposed to direct sunlight; the margin often inrolled somewhat when young, and usually splitting when mature. 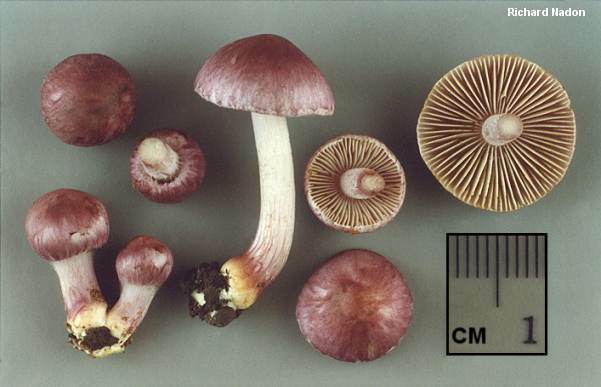 Gills: Attached to the stem, sometimes by a notch; close; whitish or pale lilac, becoming grayish brown and eventually brown with pale edges; covered at first by a cob-webby white cortina. Stem: 3-6 cm long; up to 1 cm thick; equal, or enlarged toward the base; dry; finely hairy; lilac and whitish; the base whitish; sometimes with a faint ring zone. Microscopic Features: Spores 7-9 x 4-5.5 µ; more or less elliptical; smooth. Pleurocystidia 40-60 x 10-20 µ; fusoid-ventricose; abundant; thick-walled; apically encrusted. Cheilocystidia similar to pleurocystidia. REFERENCES: (Peck, 1874) Gillet, 1876. (Kauffman, 1918; Kauffman, 1924; Smith, 1949; Smith, Smith & Weber, 1979; Arora, 1986; States, 1990; Lincoff, 1992; Bessette, Miller, Bessette & Miller, 1995; Evenson, 1997; Barron, 1999.) Herb. Kuo 10160403, 01130503.